This outfit started as an ode to the movie 9 to 5 but putting on a red lip and stumbling on these chainlink flowers added a pinch of Lana del Rey, who is my perennial sultry autumn soundtrack. Mostly unrelated, but still important, is this photoshoot (discovered via an IG post that Sophie sent my way). The wardrobe – especially the leopard coat – is killer. Photographed by Dani Brubaker + I'm still trying to hunt down the genius stylist behind this. 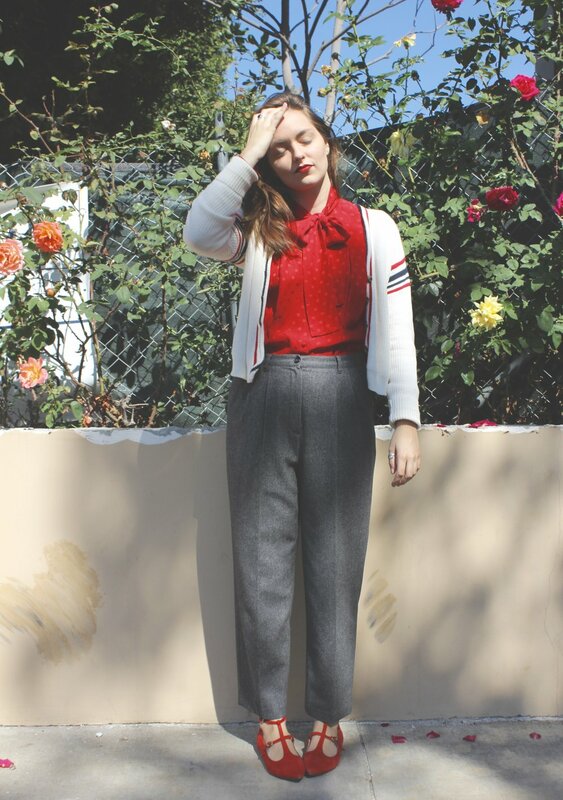 Outfit: The Balm's Meet Matte lip in Loyal + all thrifted clothing (vintage Nordstrom top, vintage Sag Harbor wool pants, Urban Outfitters BDG cardi) + my old red Free People flats (similar here, here, and here).